Galaxy clusters are the largest gravitationally bound structures in our Universe, containing hundreds to thousands of individual galaxies. The space in between galaxies in galaxy clusters is filled with an extremely hot plasma (around 10-100 million Kelvin) known as the intracluster medium (ICM). Interactions between galaxies and the ICM as they move about within the galaxy cluster cause irreversible changes to the galaxies themselves. For example, as galaxies move through the ICM, they can be gradually stripped of their gas, called the interstellar medium (ISM), through a process called ram-pressure stripping. For galaxies with active accretion onto their central black holes, called active galactic nuclei (AGN), the jets that spew out of the galaxy can be bent dramatically as the galaxy moves through the ICM by ram-pressure stripping forces. Jets from AGN often generate significant amounts of synchrotron radiation and are readily observed in radio. Observed jets with noticeable bending are generally referred to as bent-doubles. NGC 1265 is a dramatic example of a bent-double, and one of the first discovered; Fig. 1 gives a radio image of this galaxy with jets that extend out to 500 kpc from the center of the galaxy. Studying the properties of these jets provides an insight into the interactions between the ICM and ISM, and are used to better understand the galaxy cluster environment. Some radio sources observed in galaxy clusters are classified as “single-tailed” jets. These may in fact be bent-doubles, but whose jets are too close to the galaxy to be resolved separately. Identifying jets that are bent close to the galaxy’s core would provide an indication of how deep into the galaxy itself the ICM can strip gas. The authors report on observations of galaxy NGC 1272 that show bent jets surprisingly close to its core. NGC 1272 is a large elliptical galaxy of the nearby Perseus cluster of galaxies. The authors use archival radio observations that were made with the Janksy Very Large Array (JVLA) to study the nearby and stronger radio source at the center of galaxy NGC 1275. They observe the jets at three different radio frequencies, 1.44 GHz, 1.80 GHz, and 3.15 GHz. The two jets are observed to each have roughly the same brightness, indicating that the jets are oriented roughly in alignment with the plane of the sky, or that the material in the jets is travelling non-relativistically (relativistic effects could cause differences in brightness). The observations at each of these three frequencies are shown in Fig. 2, along with the overlaid contours. The authors estimate each jet to be ~1.5 kpc in size, with a radius of curvature around 2 kpc. A radius of curvature comparable to the size of the jets themselves is striking, as it indicates that the jets are strongly bent. Fig. 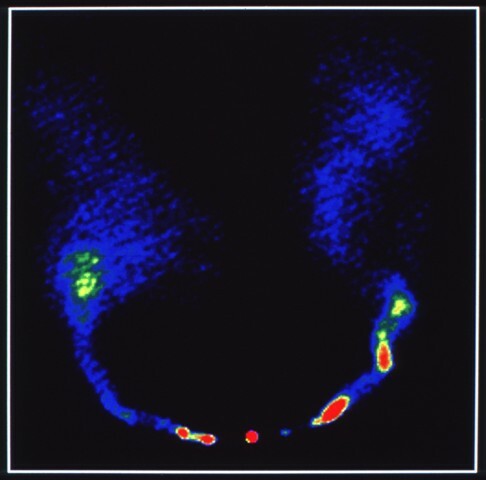 2: Radio image of galaxy NGC 1272 and its bent jets with contours shown in red for the 1.44 GHz (left), 1.80 GHz (middle), and 3.15 GHz (right) observations. The contours indicate signal at 3, 6, 9, and 12 times the uncertainty in the measurements. Source: McBride and McCourt 2014. Observing radio sources at different frequencies is a common practice that allows the astronomers to say something about the slope of spectrum of the studied object (how much light is emitted as a function of frequency). The spectral slope of the radio emission here is consistent with synchrotron emission, which confirms that the observed structure is a jet. More importantly, the authors use the spectrum and the standard assumption of equal energy density in magnetic fields and relativistic particles in the jet to learn more about the jet itself and the cluster environment. However, the authors discuss that this standard assumption fails to properly explain these jets. The assumption would imply that the jets should have collapsed long before their actual estimated lifetime (of at least a million years), or that there are vastly more relativistic protons than electrons in the jet than is expected (by a factor of ~800). Although the properties of this jet cannot be completely explained, observations of small, bent jets like that in NGC 1272 can further improve our understanding of AGN jets and their interactions with the ICM. The effect of ram pressure stripping on a galaxy is proportional to the density of the ICM and to the square of the velocity of the galaxy relative to the ICM. The density of the ICM decreases as the square of the distance from cluster center. NGC 1272 is closest known bent double to the center of the Perseus cluster by a factor of five or more to previously identified Perseus bent doubles. This corresponds to a factor of ten or more increase in density and thus ram pressure stripping, which may explain how the ICM is able to affect the ISM down to about 1.5 kpc from the center of the galaxy. Under the assumption that most of the ISM is stripped at distances from the galaxy past where the jets have been bent, the authors estimate that the surface density of gas in the galaxy is about a factor of 100 below that of gas rich galaxies. This shows that the ICM can forcibly remove a significant fraction of a galaxy’s gas as it moves within the cluster. The gas that has been removed from the galaxy could otherwise have formed stars. The authors make sure to mention that it was likely the combination of the AGN jets removing ISM gas and the ram pressure stripping due to the ICM that allowed so much gas to leave NGC 1272. Although NGC 1272 is an extreme example of a bent double, it may yet be the most extreme. As resolution in radio observations improve, some single tailed jets may be identified as doubles. With a better sample of extreme bent doubles, we can better understand the extent to which the ICM and ISM interact within galaxy clusters.